Zhu Bajie wishes you a Happy Pig Year! This Tuesday, February 5th, 2019 is the beginning of the Chinese New Year for the Year of the Pig. The pig is the last animal in the cycle of the Chinese zodiac; next year the series will start again with the Year of the Rat. It was difficult to look over my collection for older examples of pigs, but I did manage to find this pair of carved panels, taken from some larger piece of furniture, showing wild boars chasing through the woods. The scene is typical of many forest scenes, with animals wandering through a forest of trees, with birds and flowers also present. Boars do exist in the wilder parts of Taiwan; the aboriginal craftsmen use boar tusks in many types of artifacts and jewelry. The white specks in the border of the panels are crushed pearl shell, and like the gilding would have given the panel some glitter in an age of lower lighting levels. This close-up of the second panel shows the tusk more clearly. One of my earlier posts was about the pig-god, Zhu Bajie. Zhu Bajie was a character with a human body and a pig’s head, whose escapades were recorded in the Chinese classic novel Journey to the West. He then somehow became deified and entered a new career in Chinese folklore. 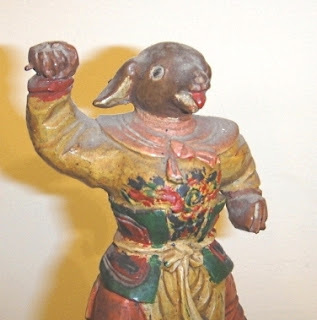 I usually don’t repeat images from earlier posts, but Zhu Bajie was so long ago that I don’t think that most of my readers saw that article, and I didn’t have the prescience then to know that I would be needing antique Chinese pigs for a future post! If you want to learn why the pig-god Zhu Bajie is revered by prostitutes, take a look at the earlier story. On Chinese New Year, the tradition is to give red envelopes filled with money to young people. To make it more fun, I try to add various small gifts associated with the specific year. This year I was lucky to find these colorful glass pig paperweights. I had the extra fun of calling people up and asking them to choose a color, without specifying why, so I would know what color pig to give them as a surprise. The colors in the photo look a little different—the originals look somewhat more intense. The pig is considered a lucky animal, and the Year of the Pig is considered especially favorable for wealth, prosperity, and even romance. Pigs are considered good at working, but also somewhat lazy, so perhaps Pig Year will favor idleness, a good sign for me personally. With all this good fortune available, do you have any special plans for the Year of the Pig? In any case, I wish everyone a happy, healthy, and prosperous Pig (or Hai) Year! P.S. This post is dedicated to blogger The Vintage Contessa and her pet pig, Banksy, who will have to be our mascot for this special year. All photos and original objects property of the author. Speaking of wealth, what a wealth of info in this post! My Rare One and I celebrate the Lunar New Year every year (pure cultural approriation!) and my post will be up on Tuesday about it. Personally, I'm a Rooster and she's a Rabbit, but somehow we make it work. Hello Debra, There are so many levels to Chinese timekeeping and astrology that there must always be some common and favorable ground. That's the way I view it, anyway. Oh oh. I'm a Nice Lady and I read your older post about Zhu Bajie. Now I'm off to enjoy a life of debauchery, ta ta! I'll always blame myself, Debra! I have not thought about using crushed pearl shell as decoration, but you are right - it just kicks up the glitter level a tad. Hello Hels, Glitter was also used on postcards in the early 20th century, but they had to stop because the coarser glitter of that era was cutting the postmen's hands! Happy Chinese New Year of the Pig Jim - your little glass pig paperweights are delightful. I am sure that the recipients will be very happy with them. I would have chosen the pale pink glass pig because he looks like a proper 'little porker'. We have just finished our Chinese New Year supper of lightly battered chicken breasts with a sweet and sour sauce, fried rice that made with red pepper, spring onions, mushrooms, corn, peas, root ginger, some soya sauce, and some duck spring rolls. Probably not really authentic, but we enjoyed it. By the way I am a horse, and my husband is a tiger. Hello Rosemary, I agree, the pink pigs are the most authentic, but I couldn;t resist buying each color. Also, that way the kids will know their own pig! These objects seem to be so exotic when one is much more used to Western art. It's ironic that the Chinese consider the pig to be a lucky animal as they delight in pork-based cuisine! Hello Bazza, Although I have been here long enough to take much Chinese art and cuisine for granted, I still do often get that "exotic" impression you mention. It keeps things perpetually interesting. p.s. Did you eat the haggis? I have enlarged my eating horizons greatly, but I am not sure if I am ready for haggis yet! Ah....my last remark was a (failed) joke about Chinese burns as in "twisted my arm"! WHAT A TREAT FOR ME AND BANKSY!How do I get one of those glass PIGS?They are GORGEOUS!!!!!! I can see them lined up on my kitchen table! I MUST DO SOMETHING SPECIAL FOR BANKSY NOW!!!! !BESIDES THE USUAL BELLY RUBS!!!! Some Pigs!... To paraphrase Charlotte in E.B. White's classic story. Happy new year Jim and may it bring you good health and fortune. Last year, my husband and I were in San Francisco and saw the Dragon parade. This year (we live in a Boston suburb)Chinese New Year is overshadowed by the Patriots victory parade. . Even so, our local Costco now sells Moon Cakes along with dumplings, seaweed salad and kimshi. That tells you how much Asian food has been adopted by American suburbanites. As a good ABC, I will prepare noodles for longevity tonight. Hello Karen, Happy New Year to you, too! Thanks for reminding us of Charlotte's Web--I haven't thought of that story for a while. You are right, it's funny how when I was growing up, "real" Asian food would have been unthinkable, but now we get it even in Cleveland. Of course, Taipei's food sometimes goes a few steps beyond even what is available in the U.S. Finally able to catch up on some blog reading. Happy Chinese New Year and may the Pig year prove to be a special one with good health and positivity! What an interesting collection you have and those human bodied, standing pigs are quite adorable. Our female ver has a pig as a pet that she often did bring to her clinic. They are so cute and absolutely house trained. I've been very busy in creating an additional blog, with Pieter's life's story with pictures etc. He got in 2012 a large book from his adopted daughter in which question got asked for answering in ink... Most of those questions hardly made sense (the author was born in 1974...) but Pieter worked with his fountain pen and numerous photos over 3 months for filling the 193 pages. Liz promised to take care of making copies as those pages were way too large for having them copied. At least back in 2012. She never followed through and Pieter had taken photos of each page. He only skipped one... But it is an interesting book that I made into a blog now. Only for his immediate family to enjoy reading, like his two nieces and great-nieces and great-nephew. It made me feel relieved for having tackled that and Pieter enjoyed reading it on the iPad. Have to do the same with my Mom's letters, by date and year, to share with my siblings. But TIME... is the limit and I doubt that the year of the Pig will give me any bonus! Also the historic photos and stories that Pieter as one of the last mushroom industry pioneers can tell, I want to complete. It is often hard with little material as his archive of old photos was left behind at the Practical Training College. Wonder where they are now as the College is no more; literally. Still I feel the urge to tell the story for others to read. We've been biking together last week and on Sunday and yesterday. It was so balmy and warm but Saturday will be cooler again. Looking forward to the spring! Hello Mariette, This will certainly be a full year for you and Pieter, with all those plans! I have been doing a lot of that too, scanning and photographing family photographs and documents, and then distributing the results to interested relatives. As for Pieter's lost papers at the Practical Training College, often when an institution closes, its archives are accepted at some other college or library--it is worth checking into. Yes, a loaded year, as usually for both of us but in a different way now. The garden work etc. we have behind us, just minimal upkeep now. We also have completed all renovations so now its just the cleaning and light maintenance, which is more than enough. We're aging and getting slower... Haha, on Wednesday I've added another digit. We biked yesterday in the most balmy weather and wearing our shorts for the first time in 80˚F weather. It cools down again and as they always say here in the South, 7 x spring... The Japanese Magnolia is in full bloom! You are so right about color description. I used to be able from the time I did study fashion and we had to read about different silks and other fabrics. Nowadays I guess they invented so many new names for paints and other things that it confuses us. Let alone you ought to describe that in Mandarin! KIMBERLY FRICK for AGELESS STYLE!